You are here: Home > Do you have all the tools necessary to maximize your production? Top agents use all the tools available to them. They never run out of leads and prospects to follow up with. They have a spending budget and they stick to it. When you are marketing to your clients, the information you send must be reliable, unfailing, and trustworthy. Retire Village sends 2 timely and well researched articles focusing on aspects of retirement and financial planning to your list each and every month, keeping you in touch with your clients. When clients view this information a tracking system is essential. 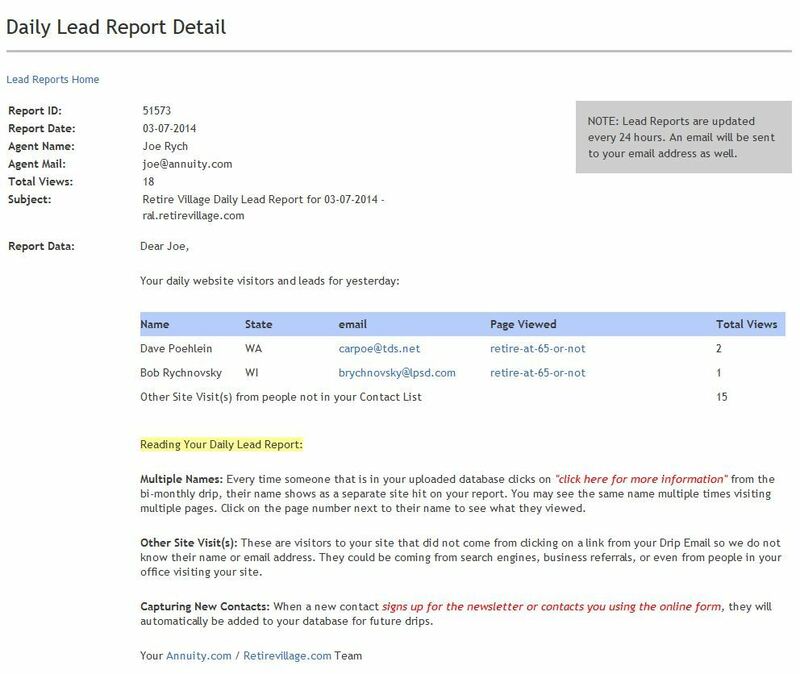 Your Retire Village Daily Lead Report will show you any Client or Prospect activity you have had on your Retire Village website. Knowing what your customers are doing keeps you one step ahead. WE HELP YOU SHAPE THE FUTURE OF YOUR BUSINESS. Utilizing decades of industry experience and functional expertise, RetireVillage.com goes beyond the norm to develop new insights, drive results, and help grow your insurance business. Our services are designed specifically to help Insurance Agents communicate with their client and prospect database, all while driving their Return on Lead Investment. Our clients also qualify for special Customized Marketing Campaigns developed in partnership with Annuity.com agents for available territories.